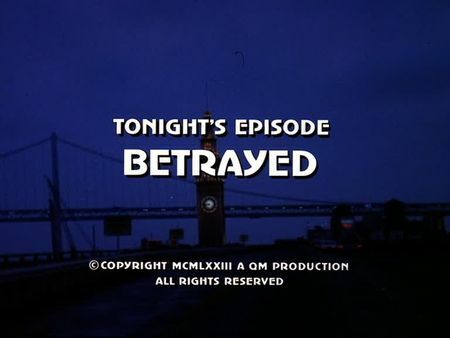 I have just added the screencaps for Betrayed to the episodes' page. Following a bank robbery during which a veteran security officer is killed, and a 40-year-old female teller, Kate Evans, is injured, Mike and Steve are running down the tapes of the surveillance camera in order to indentify additional details. Steve smells an inconsistency in Evans' testimony as he is convinced she actually knew the culprit for a certain detail. In the meantime, we learn that the bank robber, Dean Knox, is a young and smart stock exchange broker, living the life of a man-about-town who lost a lot of money which he had taken took from the brokerage company. It becomes obvious that his liaison with ingenuous Kate Evans is earmarked with just a single intention: getting information on the savings of the bank she is working for. However, following the bungled robbery he smells he has to keep her calm. When Evans discovers Knox' committed relationship to the daughter of a wealthy entrepreneur, she tries to concuss her lover. Stone and Keller need to hurry before Knox eliminates her as a witness. The opening sequence starts in a cab running down California Street, with Martin Sheen sitting in the rear. He gets off at a newspaper stand in front of 580 California Street ('The Howard Hotel'), enters that hotel and leaves it through a side-entrance on Spring Street a few moments later; the robbery takes place in the building right across that street ('Bay National Bank'). Steve interviews Kate Evans in San Francisco General Hospital, and her apartment is located in Cow Hollow, on Union Street. Mike and Steve are using a telephone booth at the north-eastern corner of Montgomery and Bush Streets, whereas the office building across the street ('Fox, Crane & Gorman'), in which Dean Knox was working, is completely rebuilt now. Our two cops are tracing the other suspect, Binx Taylor, in his apartment at 2019 23rd Street; we are also taken south to Atherton, where Knox's wealthy girl friend is living. In the final sequences of this episode, Knox and Evans are leaving for Sausalito where the crew filmed at the first class Alta Mira Hotel & Restaurant on Bulkley Avenue (now closed), whereas the climax is taking us to Battery Spencer (which, today, is another well-known lookout point right above the nothern end of the Golden Gate Bridge and part of the Golden Gate National Parks). I got in touch with Don of the oursausalito.com community who was kind enough to provide a current photo of the famous Alta Mira entrance and gateway area which will be added to the locations page soon; he also added info on this episode's filming to his website.